Before there was Macross, before there was Gundam, there was Yamato. Space Battleship Yamato (called Star Blazers in the West) is the original space opera anime and a cornerstone of anime popular culture in Japan. Now, nearly 40 years after its original television debut, a 26-episode remake of the original series is being aired in movie theaters across Japan. 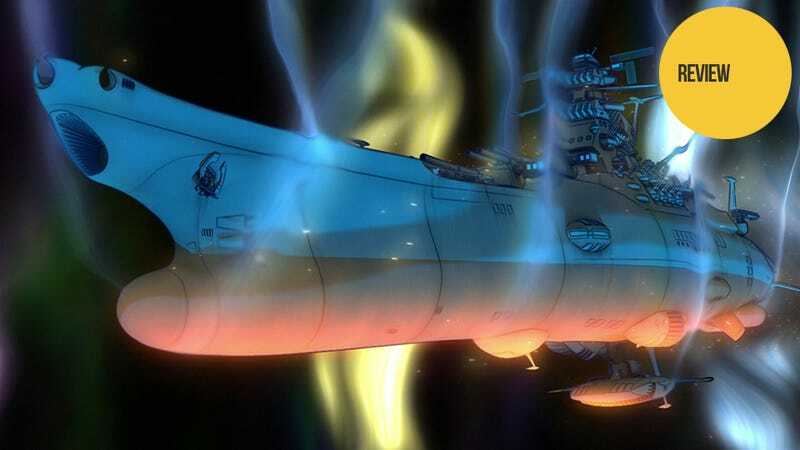 But Space Battleship Yamato 2199 is not just some attempt to play on the heart strings of older anime fans; rather it is geared to bring the animated classic to a new generation with updated story and visuals. And as the series has just reached its halfway point, let me say that so far, it is a beautiful retelling that will appeal to new viewers and old fans alike. Perhaps the easiest way of relating the feel of Yamato 2199 is to compare it to the re-imagined Battlestar Galatica series. With Earth under constant attack by a technologically superior alien race, the planet has been rendered nearly unlivable. However, a friendly race has a device that can heal the Earth if the humans are willing to come pick it up. So they send humanity the information needed to make a faster-than-light spacecraft—the Yamato. So, much like Battlestar, Yamato 2199 is the story of a single crew trying to complete an impossible mission with few supplies and no backup. Also, it explores the human side of the journey as well as the action-adventure side. An entire episode is focused around the Yamato leaving communication range and the last conversations they have with each of their family members back home. Another is spent on the capture of an enemy AI through the AI's unique point of view. And, of course, the straight up Sci-Fi space battle episodes are quite entertaining in their own right. many ways. For one thing, there is now more than a single female in the cast and the main character isn't quite the jack-of-all-trades he used to be, which allows more space for the new characters. The pace is much quicker as well. And while the story framework is largely identical to the original, there are many small changes that play on the expectations of series fans so as to deliver a sense of tension—i.e. knowing how the story should go and always wondering where the show will step off the path. Yamato is one of the most beautiful anime I have ever seen. There is an excellent use of color and the animation is perfectly fluid. But the best thing about how Yamato 2199 appears visually is the stunning attention to detail. From the flash of an explosion to the hundreds of individual rivets on a passing ship, everything is clear and beautiful. And the way ice crystals form on the ship after a warp jump and then crack and shatter in perfect clarity is downright jaw dropping. played out nearly four decades later. If you have ever watched Star Trek, for example, you will notice entire episodes that you have basically seen before. Consequently, maintaining the original plot in Yamato 2199 means that much of the tension of the story is lost—especially to those who aren't able to pick up on the unexpected small changes between 2199 and the original. That said, however, it's so easy to get caught up in the adventure, you hardly notice that you know exactly where the story is headed. So far, Space Battleship Yamato 2199 is a remake done right. The pacing is great, the art is beautiful, and it manages to be true to the original story framework while still managing to update it for the newer generations of anime fans. In other words, if you like space opera anime, this is definitely one you shouldn't skip. Space Battleship Yamato 2199 episodes 1-10 are currently available on Japanese Blu-Ray with English subtitles. A new set of four episodes comes out roughly every two months. It will begin airing on Japanese TV this April. Check back with Kotaku East in a few months for our review of the second half of the series.